Want to try food straight from the heart of the Julia Child of Puerto Rico? Visit Mio near McPhereson Square to experience Chef Giovanna Huyke’s Latin cuisine. She is a master at using cool carbs like yucca and plantains: mashing them, frying them and even boldly stuffing them with blood sausage. The Best Thing on the Menu: Calamares con Ajo, Setas y Chiles de Simojovel (pan roasted calamari with shitake mushrooms, garlic and chile) is fun for several reasons. We’re already suckers for grilled calamari … why fry something that’s good to begin with? 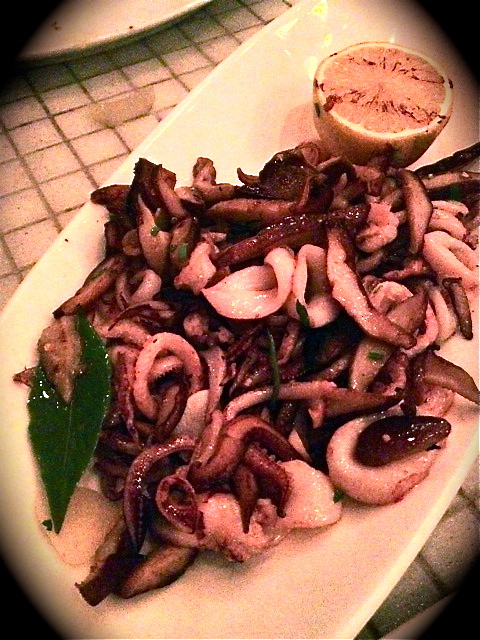 But here, the chef combines two elements (mushrooms and calamari) that have virtually the same texture. We’ve never seen this combination before. Serving this dish with a grilled lemon is an added bonus. Also, this appetizer is quite large, making it perfect for sharing. Be sure to ask for their specials. While we were there, they were offering Lechón (suckling pig) in either an appetizer or entree-sized portion. We watched as they carved it, and it was served with pickled yucca. Wanna try cooking in Chef Huyke’s kitchen? Mio offers this very opportunity. Their whole food philosophy focuses on Cocina Abierta, which means their kitchen is open to aspiring chefs, foodies and culinary aficionados, who for one night can make their Food Network fantasies come true. This “Guest Chef for a Day” program allows you to cook up a feast in support of a charity. Learn more here. Calamares con Ajo, Setas y Chiles de Simojovel not your BTM? Share your favorites in the comments section.